Are the expensive inflatable boats better than the cheap ones? Home / What Inflatable Dinghy to buy? -Should you buy a Fully Inflatable boat or a RIB? -Made in China or USA or Europe? -Cheap one or the expensive one? If you don’t know much about inflatable boats , Here are some insights you may find useful. Some questions that always arise while buying a decent dinghy! Inflatable boat / RIB or a full fiberglass/aluminum boat : This depends most on your purpose. Both have advantage, the fiberglass and aluminum boats are more rugged, take more beating and last forever. Their first advantage is that they have more seating space compared to inflatable boats. The advantage of an inflatable dinghy is that they are more buoyant therefore safer and even when filled with water, the inflatable boats stay afloat. If you are using a boat as a tender and it is often stored on top of your big boat. Then inflatable boats are easy to lift they are lighter and also being soft on the sides, they over all create less damage while maneuvering. A small inflatable RIB can also be lifted onto a bigger boat without a crane. And does not create scratches or damage to your big boat while doing so. Expensive or Cheap? :Well, if you want to spend over tens of thousands of USD for a small 3m dinghy, why not. But that does not mean you are not going to have a problem. But try to know how the product is made, the material used. Buy from a company that has enough market share and has been selling boats to people in your marina or harbor for sometime then that is a safe bet. It is not a must that your brand needs to be famous and expensive. There are some expensive designer kind of looking dinghies that have serious quality problems. China made inflatable boats or European/American : Well, hardly any other country is making inflatable boats. For speed boats and motor yachts, surely we will recommend a more known and older brands from Europe or so. But for inflatable boats, they are built in large numbers and the factories in China are producing at least 90% if not more. China factories can make very high quality inflatable boats and actually many international brands that you see are made in China or the factories have moved manufacturing there because of friendlier manufacturing regulations and availability of skilled workers too. To be honest making inflatable boat is not rocket science and past 30 something years of manufacturing, quality is not an issue. That does not mean, they are perfect, It means, that they are as good or as bad as their European / American counterparts. Being in the market for over 20 years, we get to see run down inflatable boats for all brands and they sort of deteriorate at the same rate regardless of how expensive they were. Which China brand Inflatable boat should I buy : Now, China has biggest quality diversification. It is because there is sort of a manufacturing rush (like the Gold rush) in China in past decade or so. Everyone who wants to get rich wants to start a factory, they don’t even know what type of factory, whatever products are selling in the market, they will open a factory of that product and they think they can hire expertise and make a fortune. For making decent inflatable boats though, There are only about 4 or 5 factories that have been in business long enough and know how to make them properly. And when these factories have big orders, they pass their work to the smaller factories. Some very cheap boats you can see on the internet are made by such factories. We have tested and got burned by quite a few factories we have tried to develop business with, so my suggestion would never try to order direct stuff from the internet and especially cheap stuff. PVC or Hypalon : Hypalon is an expensive material and is layers of different materials put together to create a strong smooth material that can withstand high temperatures. So yes, Hypalon is not bad and most expensive and bigger boats use Hypalon, because it is quite good at withstanding heat. Sticking things on Hypalon is however not a great thing, so the parts that are glued on Hypalon have tendency to come off, like handle straps etc. Another issue is that, when the material is damaged, the repair is much more difficult compared to PVC. Having said that, a country like Hong Kong or any other metro city, even getting someone to fix your PVC tear is a night mare and people just don’t want to do that. So it has to be a DIY thing. But overall fixing PVC is a lot easier. PVC material actually if used and taken simple care of can last very long. 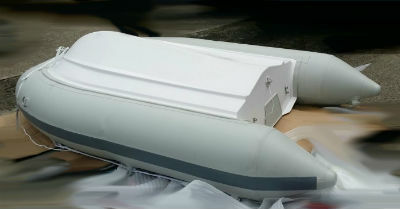 a 0.99 mm thick PVC is very strong and is good enough for heavy duty inflatable boat. It also withstands scratches. One of the things that damages it is when the boat is folded up and kept in a hot humid storage which is left to cook. The PVC starts to stick and gets damaged. Storing it in a decent room temperature or even where there is a slight airflow is perfectly fine. One thing you have to consider is the price, Hypalon is a lot more expensive compared to PVC, the material itself is more than double the cost of PVC. It is normally made in Japan or France. So even the Chinese factories import the material. Jet engines or outboard : It is up to you, if you like very fast little boat with control handles like a jetski, then it is good to get a small boat with an internal engine, why not if you can afford it. But if you want to keep some sort of value and want your money to work for you the longest, the wise thing to do is to have a inflatable boat with outboard engine. Because now the boat and engine are separate and their mechanical damages, wear and tear problems are not affecting each other so much. So if your inflatable boat tears apart or has some major damage. You can throw it away and recover your engine. Or if your engine has some problem then you can throw it away and get a new one and continue using your boat. You don’t have to throw the whole set away. Its as simple as that. What is a decent price : A very general rule of the thumb. A good quality 3 meter PVC inflatable boat should be around 3000 USD (not including the outboard engine) which will cost you another 2,000 USD more or less. As they get bigger, the prices do increase sharply, but that is because now you add a helm and a helm chair and controls etc, much more material and the boat is much heavier. So a 4.2 meter PVC Inflatable boat should cost around USD 7,500 (not including an engine) this should take about 40hp outboards that cost around 3000 USD more or less. Of course the price can be better or dearer, depending on taxes in different parts or special discounts offered by dealers. But do be aware of something which is too cheap will just waste your money. What problems do the cheap ones normally have : Mostly the materials they use such as PVC is the cheapest they can find and cannot take the beating, thin and easy to be damaged, too easily comes off from the seams. There are also plenty of factories who ignore safety standards like 3 or 4 Air chambers. Which can be dangerous in case of any accident or tear. Sometimes they claim they have all safety standards but its usually not possible to check for sure. a CE certificate with some basic safety and stability standards like ISO 6185 ensures that they are made with some international standard.